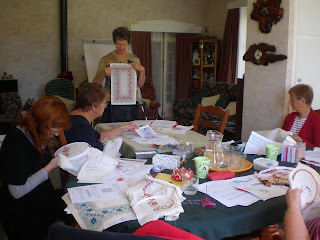 We have had our Latvian class with 21 attending the two classes and lots of progress made by various stitchers. Lots of colour choices as well with some changing colours halfway through (Lee). I have only stitched in class and pleased with my progress and colours chosen by Maree as an accident selection. 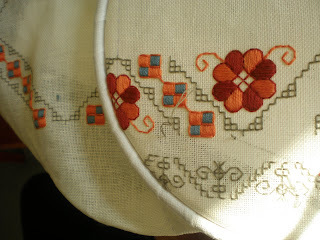 I have all but finished the stitching on my canvas biscornu and will sew it up over the weekend. I am very pleased with it despite having problems following the pattern and colours. Should have had four threads and I used five or six. Should have had five patterns with three of each stitched the same to make the 15 sides but I managed to only do two the same of each pattern and then add in my own stitches. I think this comes from having too many favourite stitches. Ann (tutor from weekend) showed us her little blackwork biscornu with 15 different patterns stitched on it. I may have to do something like that with my Florence fabric and a silk thread. I have started doing a couple of swaps with swap-BoT.com and sent my postcard off on Monday. This week I have two more to send off – need to put eyes on a Christmas decoration before I can put it in the post on Friday so that is tonight’s task. After that it will be to start the decoration for next months swap. Think I will be in advance of this one as I have my idea and want to get it made. The holidays are looking to be busier than ever and hoping to have a few days at the beach with mum at some stage so that will be lots of stitching time on walk on the wild side. Ann showing the weekday class some of her finishing and other designs. My colours. I have nearly completed one half of the holbein stitching. 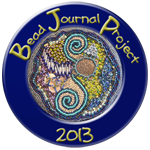 As far as beading goes I have completed febraury BJP (no photo taken yet) and it seems like the ATC size is the go for this year. I am trying to complete a couple of some of them so I can send them to Karen Cohen for the ATC swap so holidays will mean that another couple will be completed and can be posted off to her. I have the May page for 2010 to do and I am thinking about whether to continue with that series as I enjoyed the process from each person but it was really hard to get inside their heads. Seems I am not tthe only one who changed their colours the photo posted is different colours to what you started stitching in !